The term “pyrotechnics” lends itself to meaning “the science of fire.” But for most people watching a fireworks display, there is not so much science, but the wonderful art of it all! The fireworks division of pyrotechnics, aside from propellants (for rockets) and explosives (for mining and military uses), is almost entirely predicated on the show effect: the loud bang, the bright flash, the whistles and crackles, the blossoming shells, and, of course, the wonderful colors around everything! 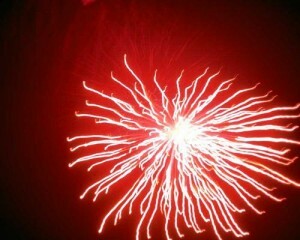 But how does a pyrotechnician, a scientist, translate chemicals into a fireworks art display for the viewer’s enjoyment? 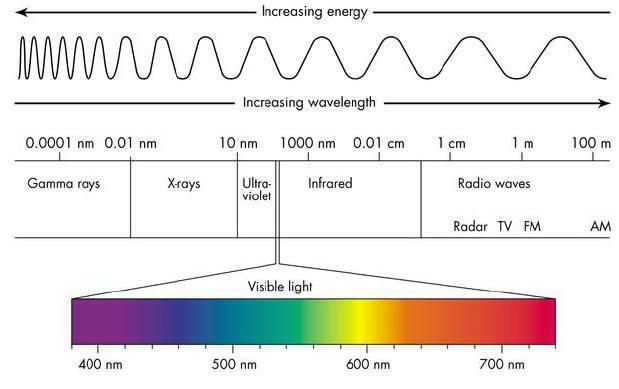 What we think of as “light” are waves or packets of energy, part of the “electromagnetic spectrum” with specific wavelengths (distance from one wave’s crest to the next) that the human eye can pick up on. The human eye can perceive electromagnetic waves that are between approximately 380 and 740 nanometers (a nanometer, or nm, is .0000000001 meters, very small!). Depending on the wavelength, the eye and brain will see different wavelengths as colors: purple around 400 nm, yellow around 600 nm, red around 720 nm, &c. Wavelengths longer than that are “ultraviolet,” and shorter than that are “infrared,” which the human eye cannot see. So, now we know what colors are to the eye and the brain, but how can the pyrotechnician “make” these fireworks colors? Chemical elements make up our world and have some names we all recognize: hydrogen, carbon, copper, and iron; while there are others may not be as well known: strontium, barium, praseodymium, and the perpetually-mispronounced technetium. These elements combine to form what we know as molecules, such as carbon dioxide CO2, water H2O, as well as barium nitrate Ba(NO3)2. If you apply heat to water you may boil it and get steam, but if you apply enough heat to barium nitrate in the right conditions you get a very deep green flame. Why is that? Both elements and molecules can be involved in an effect called “emission,” either atomic emission (for elements in their atomic form) or molecular emission (for molecules, whether in common stable forms or in fleeting unstable forms). 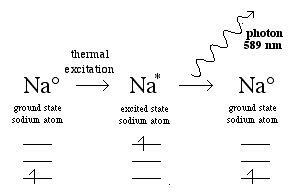 When energy, in the form of heat or flame, is applied to these chemicals, the electrons in their atomic orbitals take on that energy and get “excited,” like getting a quick sugar-high. The electrons “jump” to what’s called a higher energy state, but they can only stay there for so long; the electrons will “relax” back down to their original states, but not without passing along that extra energy that they were given. For certain elements and chemicals in certain conditions, that energy is released in the form of light of a very specific wavelength (or energy) that our eye perceives as color: red, blue, green, yellow, etc. There are certain elements and molecules that give off very useful wavelengths of light (colors) when they are heated. Barium and boron will give off green, strontium will give off red, calcium will give off orange, sodium will give off yellow, copper will give off blue, zinc will give of aquamarine, etc. In our example earlier, if the oxidizer (or oxygen source) barium nitrate Ba(NO3)2 is burned along with a fuel such as aluminum powder or an organic tree extract called “red gum,” the self-sustaining fire will be a green color from fleeting barium ions and short-lived chemicals in the flame. If a chlorine-containing compound, such as Teflon® (C2F4 polymer), the barium and chlorine elements will combine and the resulting unstable BaCl- “free radical” will emit an even deeper and more lovely green color due to some “orbital effects” on the electrons. Taking a step back: pyrotechnics and fireworks all revolve around burning of material, which is simply the transfer of oxygen from one species (the oxidizer) to another species (the fuel), and the resulting reaction products giving off excess energy in the form of heat, light, sound, &c. If you burn charcoal, that’s simply slow combustion/burning of carbon in air (ambient oxygen is the “oxidizer”) making CO2, and giving off heat and light. The pyrotechnician can augment the oxygen found in air by adding a chemical oxidizer, such as potassium perchlorate KClO4 to give off its oxygens much more rapidly, aiding the fast burn. So how does the pyrotechnician, knowing that certain chemicals give off certain colors when burned, tailor this property to the colored fireworks shells that we see every midnight on New Year’s Eve around the world and every Fourth of July here in the United States? They have different compositions and recipes used to best emit these colors, in whatever colors they can make! In this case, we have magnesium as our hot fuel that is oxidized during burning by the three other chemicals (all oxygen sources), propagating the burning reaction. The presence of strontium nitrate and strontium oxalate, as they are reacted in this hot plasma, will accept this hot burn as energy to excite their electrons, and then releasing electromagnetic radiation upon relaxation—it just so happens that they release this energy in the form of waves that we see as bright red! In this case, we again have our fuels that burn (red gum and magnalium, an organic and a metal, respectively), an oxidizer to provide oxygen (potassium perchlorate), and also our strontium to emit the red. The PVC is here as a chlorine donor to help generate fleeting SrCl- species in the plasma state that emit a deeper/brighter red color. Note the strong peak around 620 nm that we perceive as orange-red. But don’t forget, the human eye is NOT a digital spectrophotometer! A firework that you or I may see as a deep red may look “meh” to a spectrophotometer (and vice-versa: it could give you the clearest red spectrum, but we may not think it’s that great). The way that the human eye perceives color and wavelengths is “biased” in many ways in that we are more or less sensitive to different wavelengths, and therefore colors. The pyrotechnician can also mix different colors to get nearly everything in the rainbow: 85% red and 15% blue to make maroon, 80% green and 20% blue to make aqua, or even 55% green and 45% orange to make yellow! Remember: these are *emissive* colors, they don’t work like mixing paints, but like mixing colored “gels” for stage lights. Many tools are at the pyrotechnicians disposal to make colors for fireworks displays, for signals, and many other applications. From the science of light emission, color generation is a crucial part in the art of fireworks. Chris Mocella is now a tenured chemist with the U.S. Customs and Border Protection Laboratories. He began working with Dr. John Conkling as an undergraduate research associate while pursuing his Bachelor’s degree in chemistry at Washington College in Chestertown, MD, with a focus on energetic materials and pyrotechnics. Chris continued working with the Summer Pyrotechnic Seminar series while attending the University of Virginia for graduate school in organometallic chemistry. Most recently, Chris was co-author on the second addition of Dr. Conkling’s The Chemistry of Pyrotechnics book. 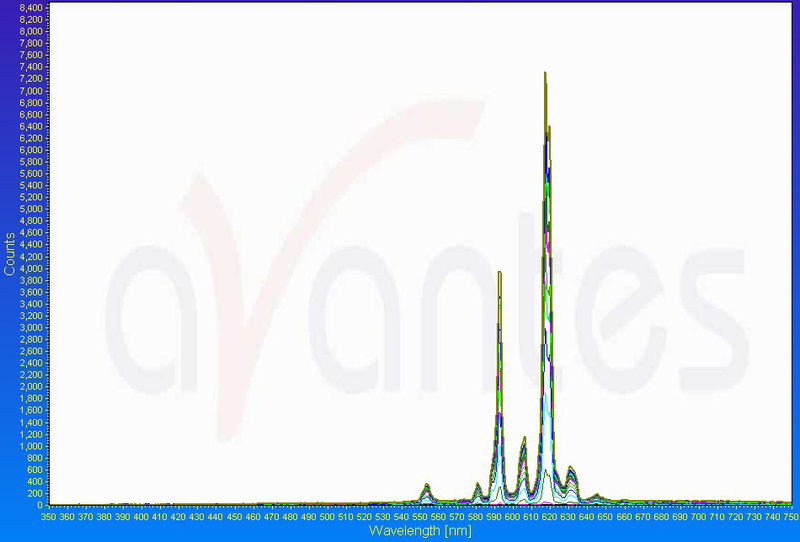 Original publish date: March 1st, 2012.
higher frequency emit UV and X….